Optical Filter is a device that selectively permits transmission or blocks a range of wavelengths. 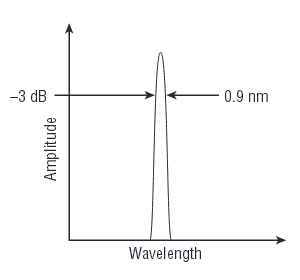 Optical filters are typically bandpass or band-reject (shown in the figures below). 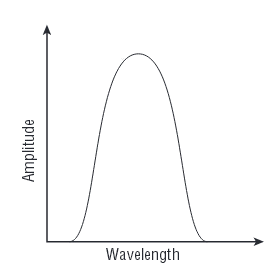 A bandpass optical filter allows a certain range of optical wavelengths to pass and attenuates the rest (left), while a band-reject optical filter attenuates a band of optical wavelengths and allows the others to pass (right). An example of a basic optical filter would be the optical filter used on a traffic light. A typical traffic light contains three optical filters, one red, one yellow, and one green. The bulb behind each optical filter is the same and emits a wide range of visible wavelengths. The optical filters allow only a certain range of wavelengths to pass, creating the red, yellow, or green light. 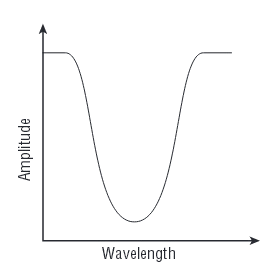 Bandpass optical filters are designed to transmit a specific waveband or wavelength range. A wideband optical filter may allow wavelengths plus and minus 20 nm off the center frequency to pass. This type of optical filter would be used when signals are separated by several hundred nanometers, such as with a 1310 nm and 1550 nm source (e.g. as a CWDM Filter in CWDM Multiplexers). A narrowband optical filter allows only a very narrow range of optical energy to pass, as shown beside. The bandwidth of a narrowband optical filter may be less than one nanometer. The narrowband optical filter would be used in DWDM applications as a DWDM Filter to reject adjacent optical channels. Each of these optical filter types is simple in theory yet is a vital part of some fiber optic systems. As stated, an optical filter is a device that selects the wavelengths it will allow to pass and will reject the others. Thin Film Filter (TFF) is a special optical filter that is generally used in the WDM optical network applications. The Filter-based Wavelength Division Multiplexer (FWDM) is extensively used in CWDM & DWDM multiplexers/demultiplexers, EDFA optical amplifiers, and fiber optics instrumentation etc. FWDM combines or separates light at different wavelengths in a wide wavelength range. Fiberstore provides a series of FWDM which covers the following wavelength windows: 1310/1550 nm for WDM or DWDM applications, 1480/1550 nm for high-power DWDM EDFA, 1510/1550 nm for DWDM multi-channel optical networks), 980/1550 nm for high performance DWDM EDFA, and 1310/1490/1550 nm for PON/FTTX/instrument test. This entry was posted in Optical Filter, WDM Optical Network and tagged CWDM filter, Filter WDM on January 31, 2015 by Admin.